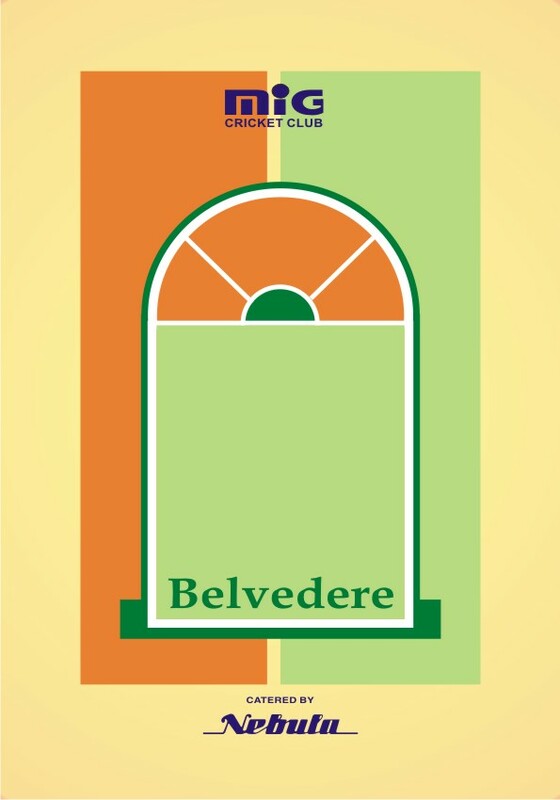 The wonderful ambience and the sumptuous food on offer attract people to Belvedere. The charming decor and friendly staff make the restaurant popular with the members as well as their guests. Nobody leaves Belvedere hungry or unhappy. 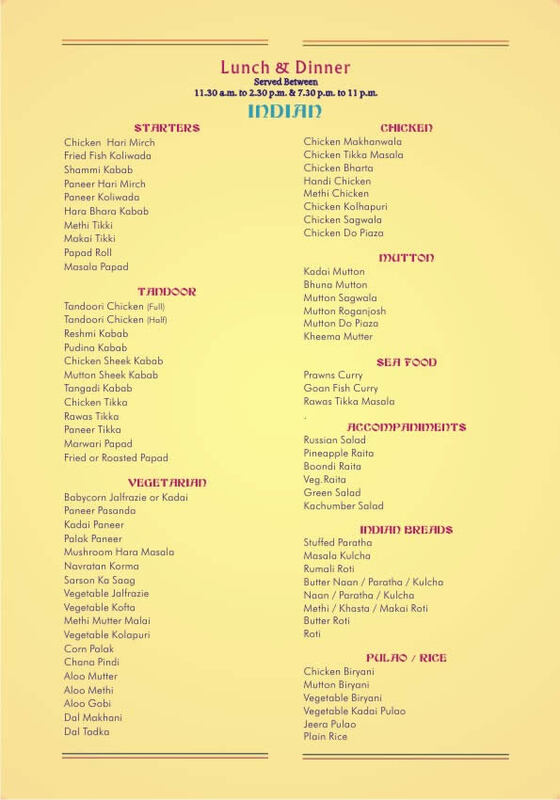 From Punjabi and Maharashtrian to Continental and Chinese cuisines, and of course an array of mouth-watering desserts, there’s something for everyone’s palate. 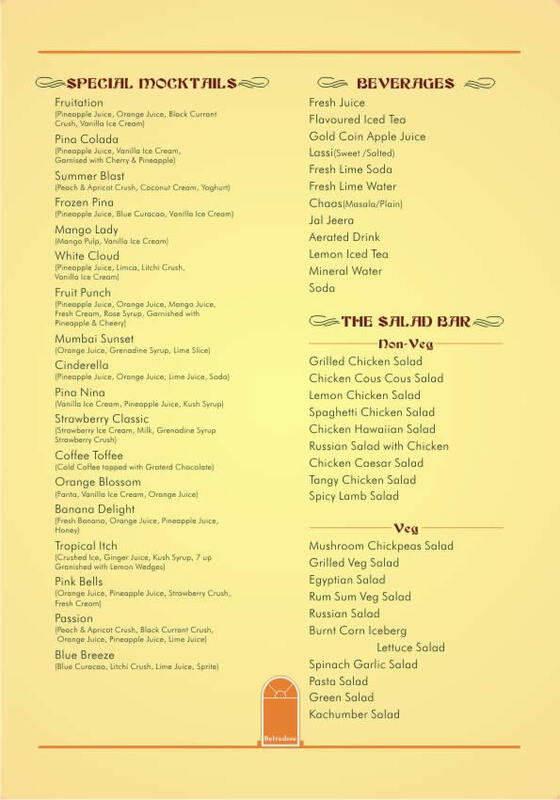 Special menus are available for special occasions like ‘Gatari Amavasiya’ and during the month of Shravan. All this, topped with a table offering a view of the swimming pool, makes a perfect setting for a tasty and satisfying meal. First Session: 11.00 am to 3.30 pm. Second Session: 07.00 pm to 12.00 midnight. Only Beer, Wine & Breezer will be served. Payment of bills should be made in cash, by credit card. Shorts/singlets and any scanty dressing will not be allowed for adult male members. Temporary Member Fee of Rs. 25 per person will be charged in cash only. Members should contact Manager/Captain for any change in seating arrangements. The request will be considered, if possible. Members must write their name and membership number clearly on the Order Form and inform the order taker regarding the number of guests accompanying him/her. Only up to 8 guests shall be allowed per member. Members should present their identity cards when demanded by the Manager. Members should be present within premises if he/she brings guest. 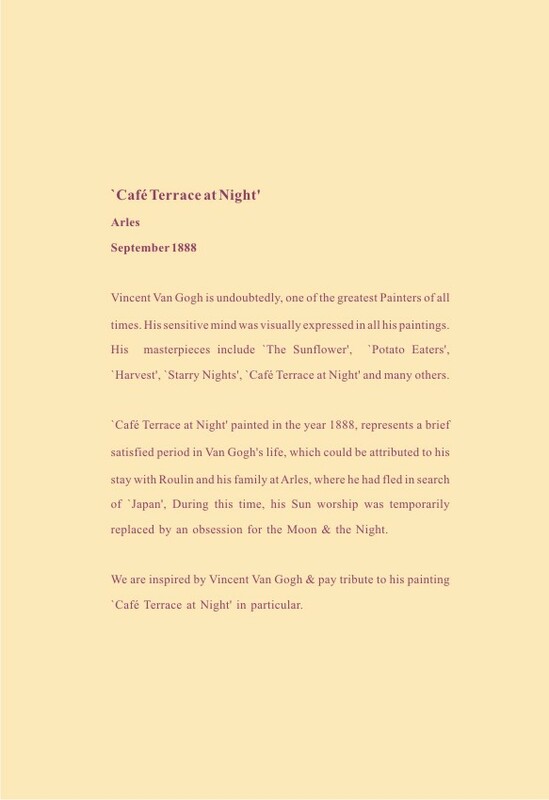 Vincent Van Gough's brush strokes generously lend their charm to this cafe named after his masterpiece Cafe Terrace at Night. Overlooking the swimming pool and engulfed in an icy shell of glass, this place draws its coolness from its decor and its casual environment. One can walk in with sportswear or shorts, and enjoy anything from titbits to a hearty meal. 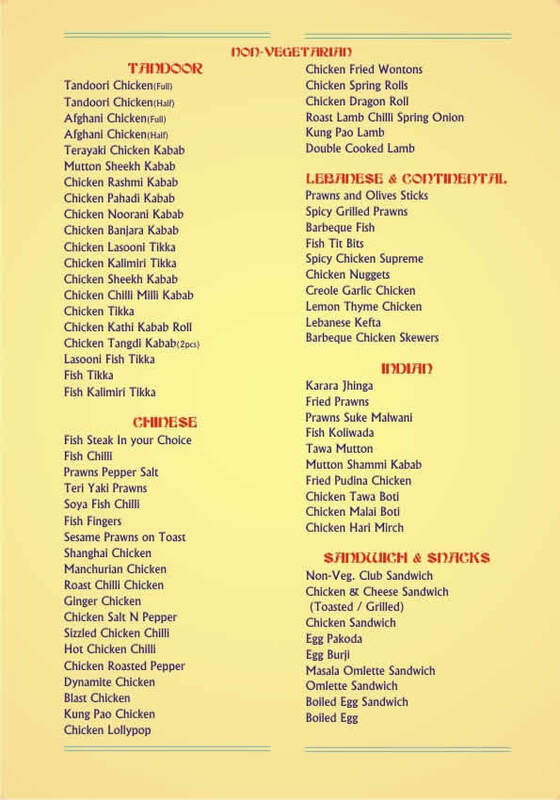 The menu sports a variety ranging from Maharashtrian, Punjabi and Continental as well as Chinese cuisines. Snacks are as varied as the lunch and dinner options. Its excellent coffee is much sought after by connoisseurs. All in all, a charming and informal venue to relax and unwind. 07.00 am to 12.00 midnight. Only Beer, Wine & Bacardi Breezer will be served. 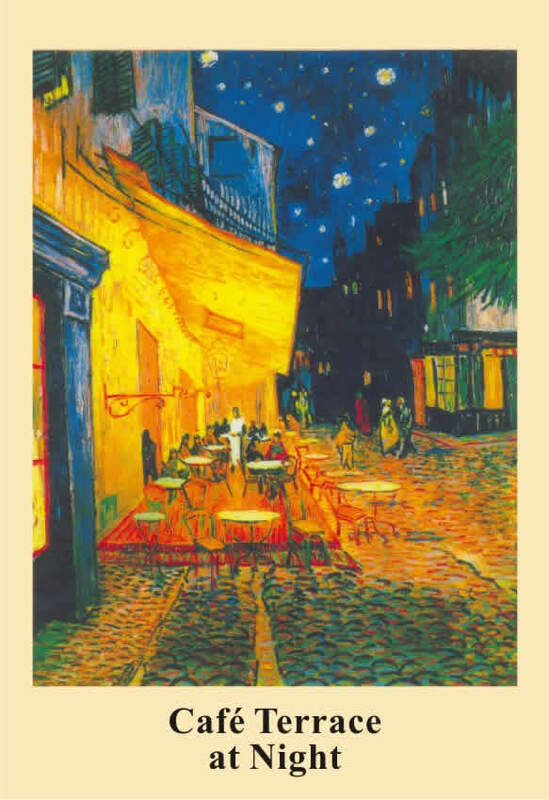 I was floored when I was told that a coffee shop by the name Cafe Terrace at Night was to replace the card-room on the first floor. I started dreaming of a 24/7 eatery, but my excitement mellowed a little, though not entirely, on learning that it was essentially a day joint but would stay open for sometime past midnight. If I remember right, the café was inaugurated in 2002. During the last ten years it has not changed its looks. It is a very casual place and one can enter with gymnasium, badminton or cricket clothes, which is not the case in our bar or restaurant. Hence, it is very popular among all the members. Dwelling over the breakfast menu, I relish Spanish omelet with toast butter. 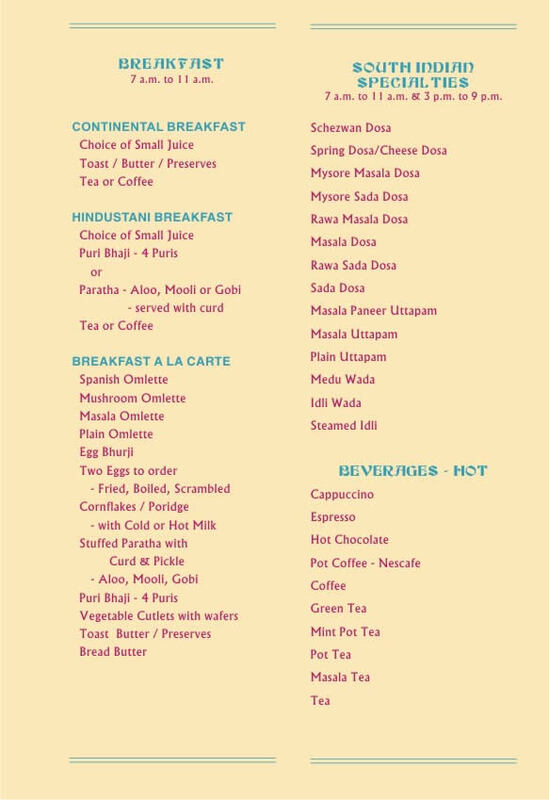 Seldom I do I have an Indian breakfast, which is very sumptuous. Being an all-day eating place, one can get a full meal even during odd hours, though the menu is limited during at such times. 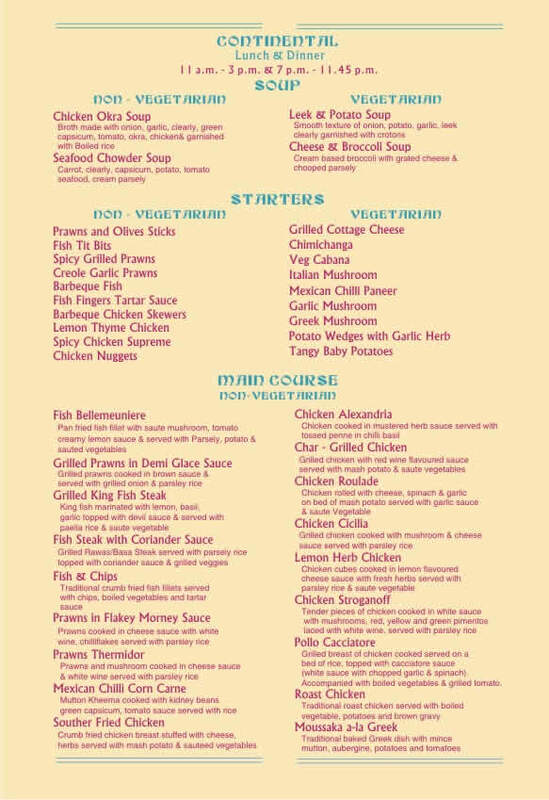 Your get an array of delicious cuisine from all corners of the world ranging from the Middle East to Mexico and Italy. 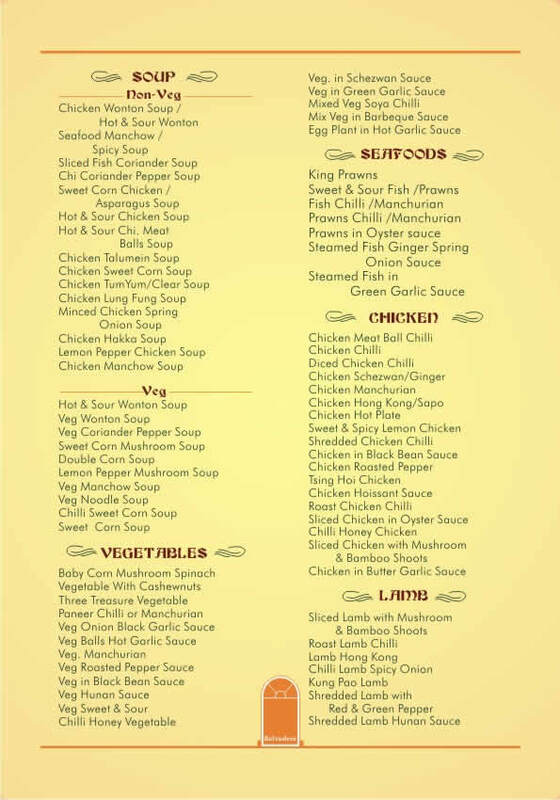 Continental cuisine is served with authentic sauces. I love lamb sizzlers very much. The hissing sound of the sizzler tickles one's taste buds. 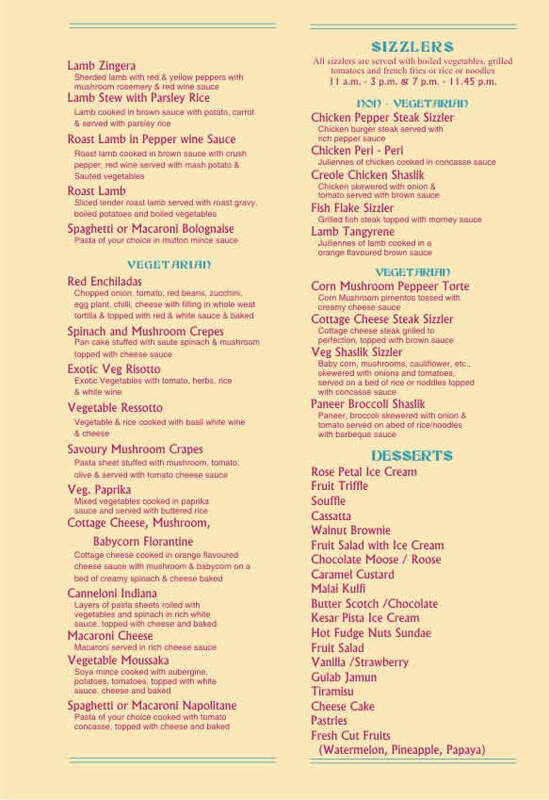 The Italian menu is also much sought after by our members. 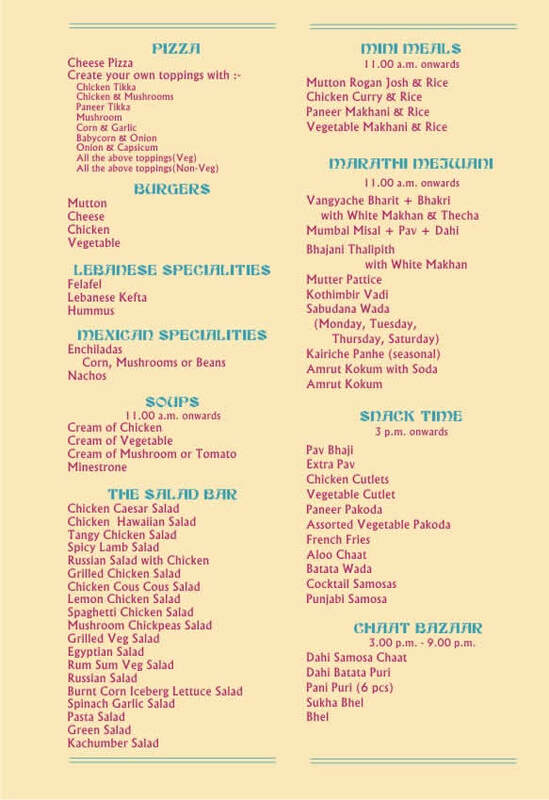 From of the South-Indian menu I have a penchant for rava masala dosa with coconut chutney and sour sambhar. Out of the sandwich block menu, I love roast lamb sandwich filled with tiny pieces of lamb and mayonnaise. 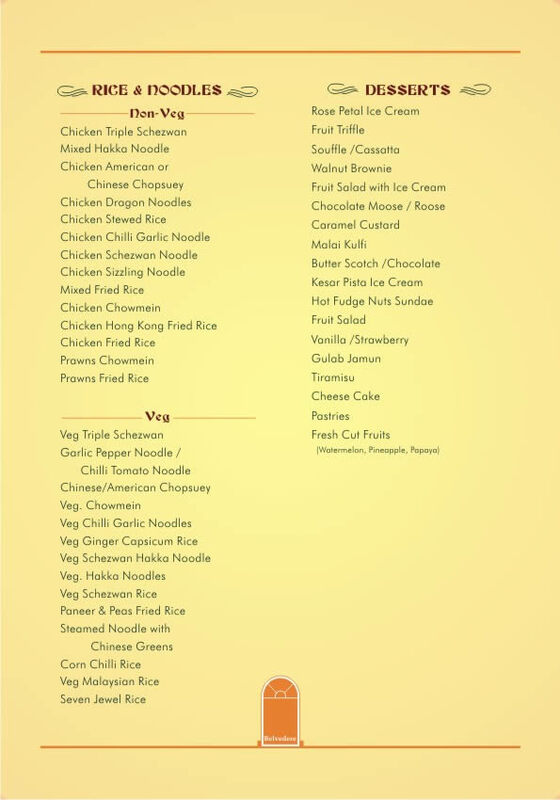 Though this item is not listed on the menu, it is favourite amongst members. 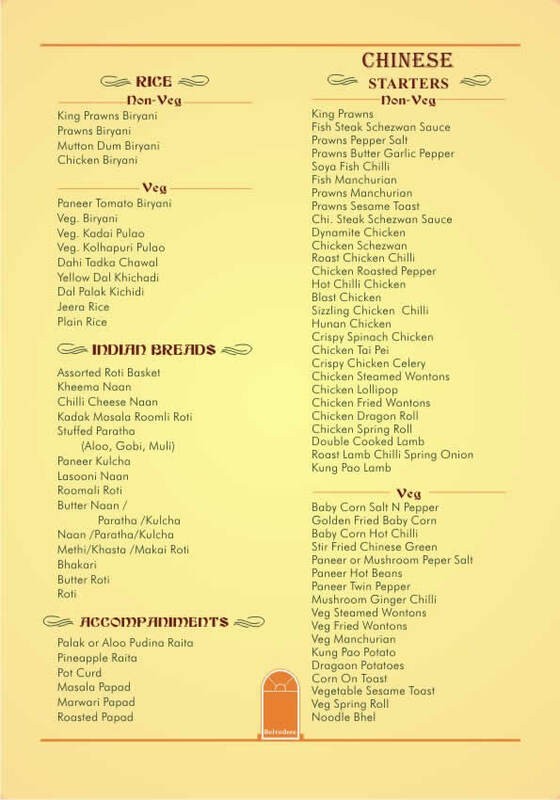 Coming to the Maharashtrian menu, one can have a wide choice for quick bites. 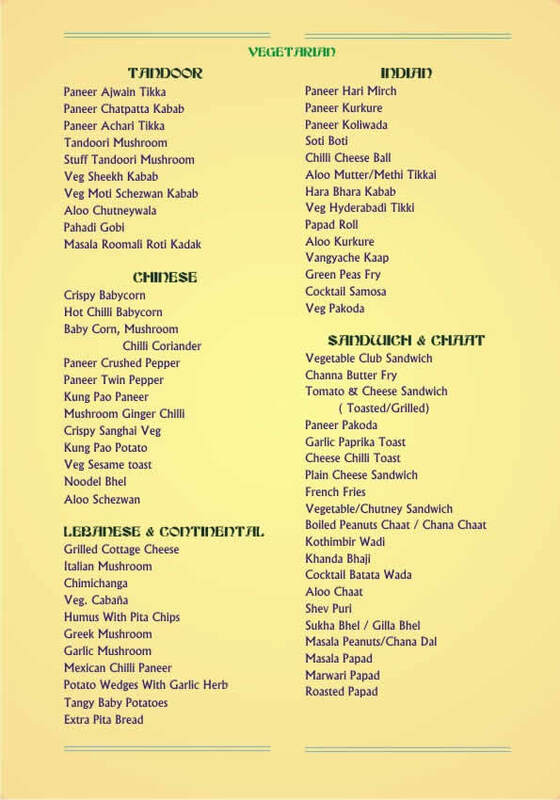 You can have batata vada, kothimbir vadi, sabudana vada, misal and thalipeeth. Those who are hungrier can have vangyache bharit and bhakari. The extended hours up to midnight give you ample time to watch a movie and come to the café and have dinner. The service is very courteous and unobtrusive. My favourite sitting place is from where you get a glimpse of the swimming pool. During the course of the day I visit the coffee shop at least three times. The staff is very humble and greets one with a big smile. 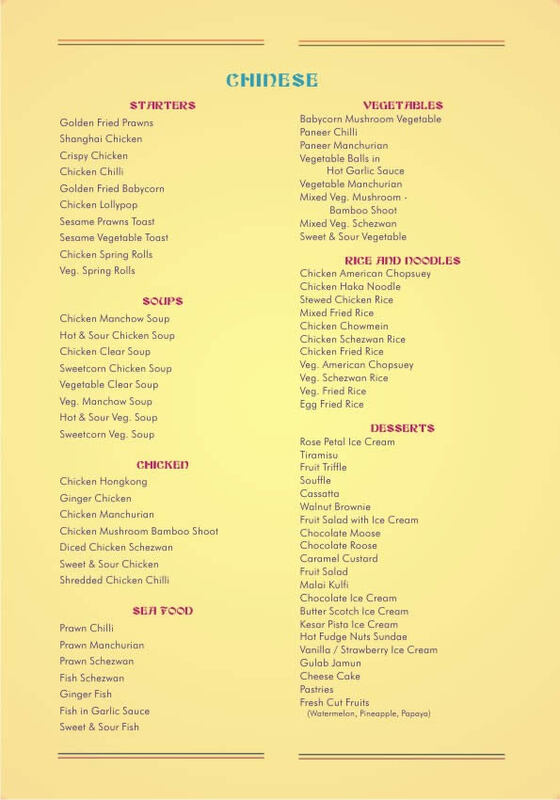 The restaurant menu is also served here, and so it is very crowded on Sundays when members come with their families. It serves only mild liquor; hence, it is not popular with tipplers. 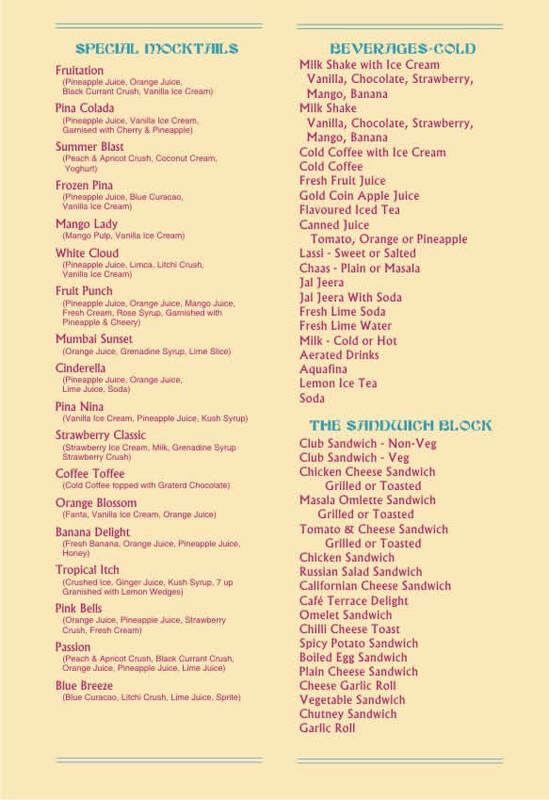 About desserts we can splurge on a wide choice of hot and cold desserts. My favourite is rose petal ice cream. During the gatari festival, I skip both my meals at home and feast on non-vegetarian delicacies for the whole week. 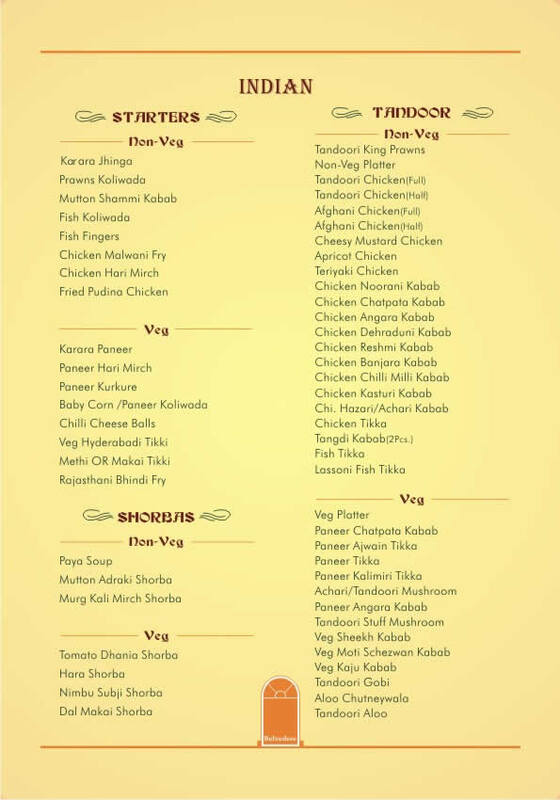 You can have a wide variety of Maharashtrian style non-vegetarian food during the week before Shravan begins. 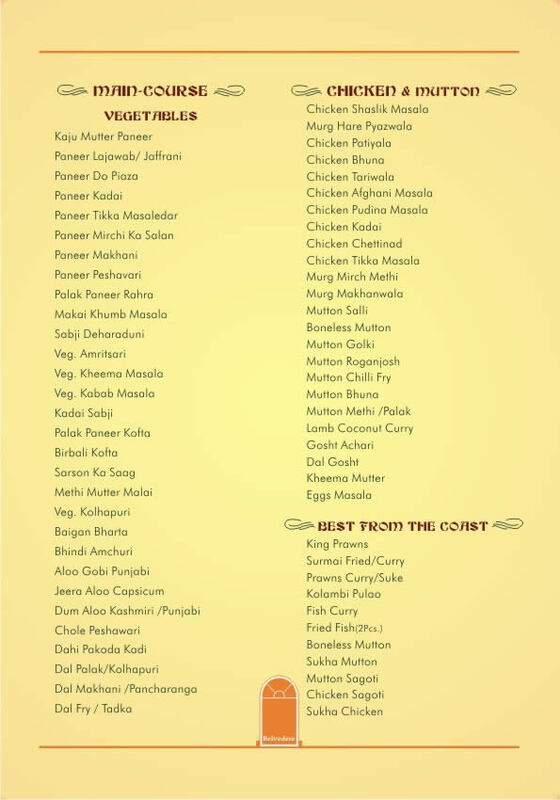 My favourite dishes are tandoor khekda, fried bombil and solkadhi. After gatari amavasya is over, the next month of Shravan brings a score of vegetarian delicacies. During Shravan also I skip my dinner at home and feast on various items such as patoli, masale bhat, dalimbi usal, ukdiche modak with sajuk tup, ambadichi patal bhaaji and so on. My friends crave to dine at our coffee shop during Shravan to feast on the offered in this pavitra month. 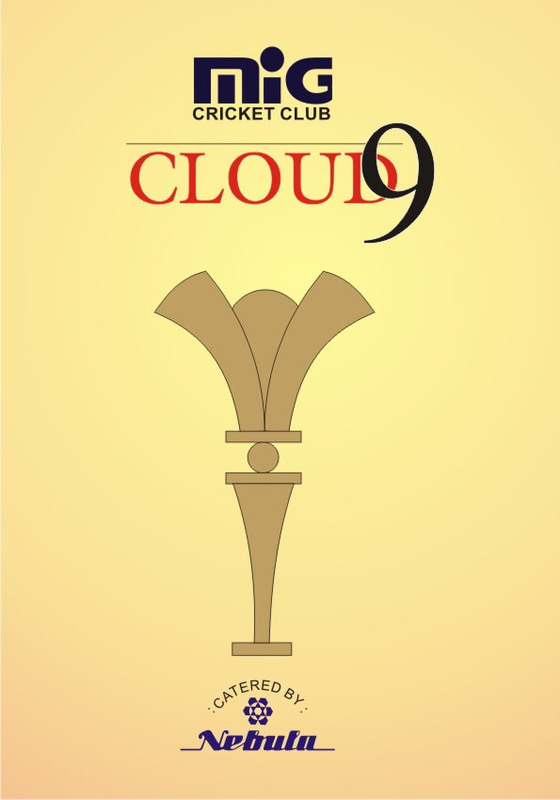 Cloud 9, though well entrenched on the ground floor, has all the necessary energy to get you into the clouds. This watering hole of the Club members with its tranquil wooden furniture juxtaposed with rich and exciting violet wall-paper, serves quality liquor and equally exciting food. The best foreign and Indian brands of liquor, draught beer, a lavish spread of snacks, excellent spread on the food menu and the force of lively discussions, games and music together give the bar an ethereal feel. Popular among members, the young of course thrive in its excitement, but the older members are also to be found here, chatting excitedly, resounding with laughter. First session: 11.00 a.m.to 3.00 p.m.(Monday to Friday except Bank Holiday). 11.00 a.m. to 3.30 p.m. (Saturday, Sunday & Bank Holiday). Second session: 6.30 pm to 12 midnight. Persons below the age of 21 years are not allowed in the Bar. Payment for the bills will have to be made in cash or by credit card only. Shorts/singlets and any scanty dressing will not be allowed for male members. Members should contact Manager/Captain for any change in seating arrangements. The request may be considered, if possible. Members must write their names and membership numbers clearly on the order slip. Liquor drinking permit is compulsory for the members visiting the Bar. The facility of one day drinking permit on payment Rs 5 is available. Members should vacate the Bar before 12 midnight. Galaxy and Pole Star, the two air-conditioned banqueting spaces are greatly sought after by members and are booked throughout the year. 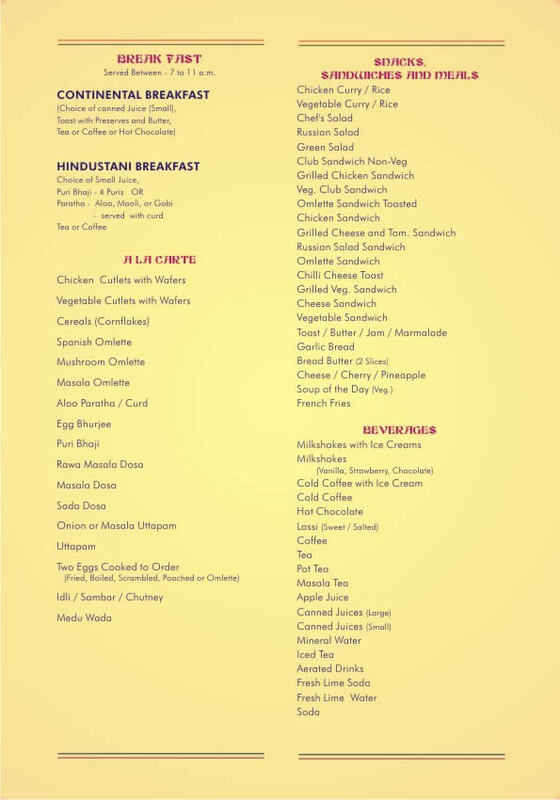 Catering for both is provided internally by the Club. Pole Star on the second floor has a capacity to accommodate thirty guests. It gives a beautiful view of the swimming pool and is usually used for smaller functions such as small family get-togethers, birthdays etc. 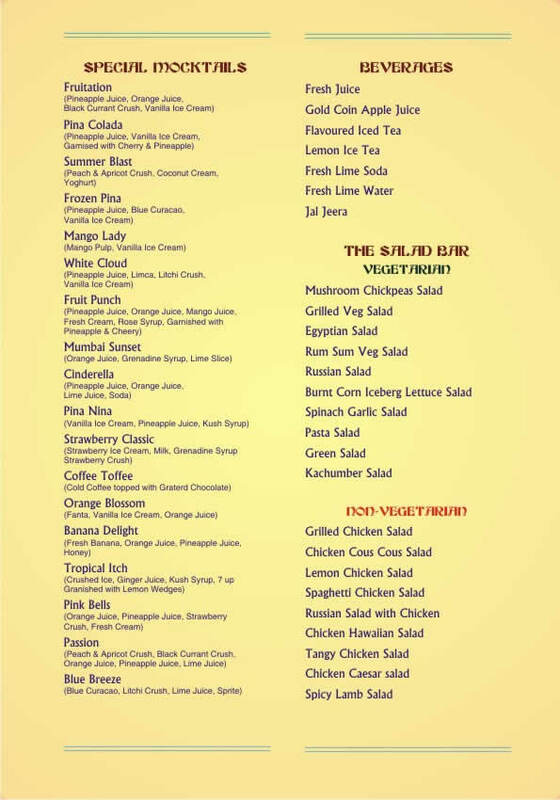 Galaxy on the second floor can accommodate hundred and seventy guests. It overlooks the road on one side and has a beautiful view of the swimming pool on the other and is generally used for bigger functions such as marriage receptions or engagement parties. The open banqueting spaces 'Bird's View' and terrace banqueting facility called 'The Roof Top' with a capacity of 500 are also popular with members. The 'Pavilion' on the first floor can also be used for banqueting when not in use for cricket purpose. GST is applicable as per prevalent rates (Presently-18%). Additional Charges for Extra Electricity & other charges applicable. Booking will be taken only in the name of member. Presence of member at the time of booking will be mandatory. Security Deposit will be refunded within 15 days of Function after the deductions of extra hours, damage charges etc. Liquor Permit is compulsory by law. Liquor permit should obtain atleast two-three days before of the party date. Liquor stock should be purchased on your allotted Liquor Permit from the authorized liquor distributor or wine shop only. A photo copy of the liquor purchased bill should be submitted to the bar section. Duty free liquor stock and liquor purchased stock without allotted liquor license/permit no. is not permitted/accepted. Corkage fee will be charged on your liquor stock as per rate card/schedule. Corkage fee will be charged on the consumption only. Individual liquor permit is compulsory. If member/guest does not have liquor drinking permit, then he/she must take one day liquor permit from the bar section on payment of Rs 5 per person. Bar will close at 11.00 pm. Guest rooms are on the third floor and the ones in the left wing have a pool view. Due to their comfortable interiors and the Club's central location, the rooms are a much sought-after facility by members' guests and members from affiliated clubs. The Club has 20 air-conditioned guest rooms and two air-conditioned suites. Members of affiliated clubs can book rooms for themselves. In case you decide to shorten your booking after the check in CANCELLATION POLICY We would love to host you but in case your plans change, our simple cancellation process makes sure you receive a quick confirmation and fast refunds. 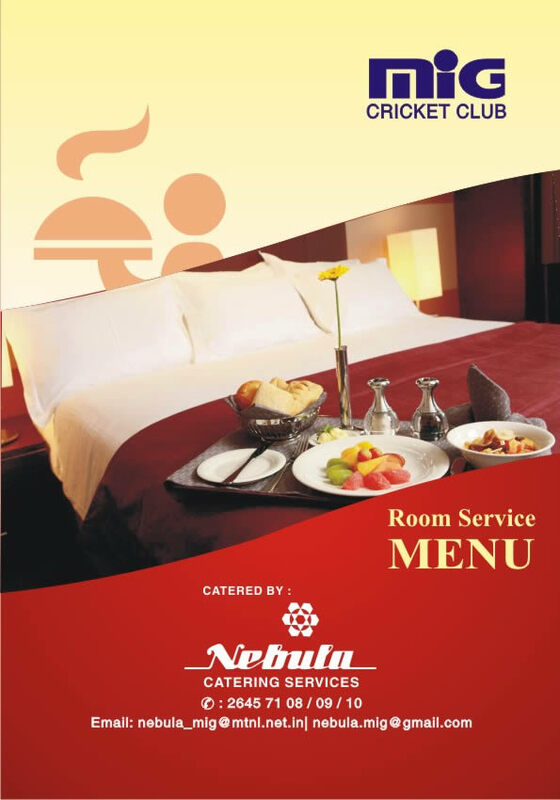 Our standard check-in time is 12 noon. On the date of check-in, in case you decide to cancel a booking after check-in time or do not show up at the Club, charges for the first two nights or the complete booking amount, whichever is lower, shall be deducted. In case you decide to shorten your booking after the check-in date, you will be charged for the next 24 hours after the official cancellation. Money for the remaining nights will be refunded. Love cricket, sport, fitness and food? Well, there's only one place to be. What are you waiting for? Copyright © 2017 . All rights reserved by MIG Cricket Club. Powered by Footmarque Services Pvt. Ltd.